It’s the eve of the 2008 presidential election, and this has been an absolutely fascinating campaign when viewed through the lens of brand positioning. I’m not writing today to endorse either candidate, but rather to offer a few thoughts about the strategies and tactics used by each. The messaging of Barack Obama’s campaign has been remarkably consistent since its inception. The theme of “Change” – sometimes presented as “Change We Can Believe In” or “Change We Need” – is quite potent at a time when disapproval ratings for the sitting president hover around 70%. (Which is to say a large portion of the electorate is not pleased with the current Republican experience – in politics, as in branding, experience usually trumps messaging.) In other words, Obama’s campaign selected a positioning that the market clearly desires. The “Change” positioning also enables Obama to take a potential negative – his lack of experience – and re-cast it as a positive. If ever there was an election where lack of Washington-insider experience could be portrayed as an advantage, this is it. Positioning is relative. For the “change” claim to stand up, Obama doesn’t need to prove that he is the man to deliver change – he simply needs to convince you that he is more likely to deliver change than John McCain. Obama ads that feature McCain admitting that he voted with George W. Bush “over 90% of the time” drive this point home with a powerful simplicity. Strategically and tactically, Obama has led the most innovative presidential run in history. He has harnessed the internet, text messaging, and other tools, reaching young voters via the channels they use. And he has succeeded in creating hordes of “brand champions” – the people going door-to-door, wearing the Change t-shirts, and donating all that money. Clearly, he has energized a base in a manner that Kerry and Gore did not even approach. After the election, Obama’s campaign will be studied closely, and its lessons will affect every future major campaign. Given Bush’s (dis)approval ratings, any Republican candidate for president would need to run a better campaign than his Democrat opponent. McCain hasn’t accomplished this. I honestly can’t say that I know what McCain’s position is. 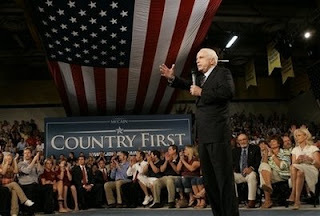 As I write this, “Country First” is the lead messaging at JohnMcCain.com, and that’s the slogan I’ve seen most often. However, apart from McCain’s commendable military service, he’s offered little to support “Country First”. Worse, his choice of Sarah Palin as his running mate undermines his own positioning. With polls showing that 50%+ of Americans believe Palin is not qualified to be president, McCain’s commitment to “Country First” is implicitly called into question. Other McCain messaging is even more curious. “The Original Mavericks” was more credible eight years ago, when McCain was without question perceived as a maverick within his own party. (His “Straight Talk Express” was a genius stroke to support this position.) Again, however, his Bush-aligned voting record helps Obama to re-position McCain as not a maverick, but as “another W”. The use of the plural suggests that Palin is also a maverick, but her record is far too short to justify this. Finally, McCain has suffered in the “brand character” department. In the debates, for instance, while Obama remained poised and polished, McCain often seemed condescending and cranky. And referring to a fellow senator as “that one” simply shows a lack of class. Brand character helps buyers (voters) to identify in one of three ways – “people like me, people I like, people I want to be like.” McCain struggled to pass even some basic “likability” tests. These last few days, both on SNL and on the campaign trail, McCain has seemed looser and more self-deprecating. But it may be too little too late. I’m aware that the above is short on substantive matters like policies and issues. In a perfect world, of course, substance would decide every election. However, matters of policy can be difficult for voters to grasp, and voters today suffer from information overload. Successful political campaigns, like successful brand campaigns, must unify and convey their stories with simplicity, consistency and credibility. Obama did this, and McCain did not. I’ll offer no predictions for what will happen in the election tomorrow. But should Obama win, it will be in no small part because he ran the superior campaign. Whichever side you support – get out and vote tomorrow! And may the best ticket win.